Cheyenne Frontier Days has announced the complete lineup for 2018 Frontier Nights with the addition of Nickelback on July 26 and Toby Keith on July 27. 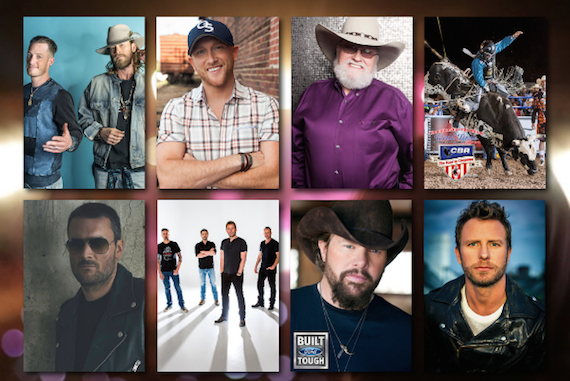 Held at Frontier Park in Cheyenne, Wyoming, July 20-29 “The Daddy of ‘Em All,” will feature some of the biggest names in country music. Kicking off the first night of Cheyenne Frontier Nights, breakout artist Michael Ray will join superstar duo Florida Georgia Line on Friday, July 20. Platinum-certified for his single, “Ready Set Roll,” Chase Rice will join record-breaking seven-time No. 1 hit-maker Cole Swindell as he headlines on Saturday, July 21. Following two back-to-back nights of Championship Bull Riding, Grammy-nominated singer and co-writer of the most downloaded song by a female country artist since 2015, Cam will take the stage to open for Eric Church on Wednesday, July 25. Dubbed as “one of the most versatile [acts]” Bobby Bones & The Raging Idiots with second generation cowboy Ned LeDoux will both open for newly announced headliner Toby Keith on Friday, July 27. Closing the final Frontier Nights performance alongside Dierks Bentley on Saturday, July 28 will be ACM, CMT and CMA nominee Kip Moore. Tickets will be available for purchase on Friday, Feb., 2 at 9 a.m. MT on cfdrodeo.com, the Cheyenne Frontier Days ticket office or by phone at 307-778-7222.